The following guidelines refer to the system admin when opening Hyper for the first time. After creating the Data Base of Hyper, it is available for the organization's system admin and can be opened for defining its primary settings. The first Log-in opens Hyper in a "Setup Mode". In that case, the system does not have any contents or definitions that are required by the organization, and it allows the system admin to create these initial definitions and contents. The system admin can use the setup mode, as long as there are no defined users in Hyper. System Definitions in Setup Mode * - The basic definitions of the system. These definitions should be defined on the first log in to the system, in order to allow the organization's users to use Hyper. For further information, please read the next section or click here. Mandatory Fields definitions * - Define the mandatory fields in Hyper's tables, according to the organization's needs. These definitions should be defined on the first log in to the system, in order to allow the organizations users to use the relevant tables and information fields. For further information, click here. Calendars definitions * - The definitions of the organization's Calendars and meeting management. These definitions should be defined on the first log in to the system. For further information, click here. Products and Orders definitions - Create product cards and define the orders system settings. These definitions are essential in order to allow the sales process. These definitions should be defined with the relevant managers and decision makers of the organization, as soon as possible. For further information, click here. Filters definitions - Create new filters in Search Wizard of Hyper. For further information, click here. Import Clients from a List - Import the organization's list of clients in to Hyper and create client cards. For further information, click here. Web Data Port - Define the data import tools, from external sources. This tool was designed for organizations that usually receive leads from landing pages and Emails. For further information, click here. Static Text Element * - Define templates of contents that the organization usually sends to its clients, according to their activity. This tool is usually used by trading companies. for further information, click here. (Please note - in the setup mode, all of the the authorizations are available for the user). Global & Basic Settings - This tab of the system fundamentals, displays the basic definitions for the database, and therefore must be the first to be defined by the system admin. All of the mandatory fields in this tab must be defined. Press the Save Settings button to save the definitions. For further information click here. Management - The authorization group for the system admin and for some of the organization managers. This authorization allows a full access to all of Hyper tools, tabs, definitions and functions. Hidden - An authorization group that gathers the most important information tools, tabs and buttons. This authorization will be defined for special group of users (usually for the owners and for senior managers). General - The general basic authorizations, for most of the users. The basic settings of this group can be copied, to any new groups with specific required authorizations, that will be added to these settings. In order to create a new authorization group, press the Create new button. For further information about Authorization Groups, click here. Users definitions - Define the Hyper users of the organization. At first, create a new user for the system administrator. The rest of the users can be defined later. In order to create a new user, open the "Employees Module". In the "Employee Cards" tab, press the Create New button, and create a new "Employee and a Hyper User". For further information about the new user definition process, click here. During this process, the system admin should define the users interface language, authorization groups as well as the username and the password for logging in to Hyper. In the new employee card of the system administrator, choose "YES" in the "Enabled to Modify System Fundamentals" field, in order to allow the system admin to modify and define the system fundamentals on his next login to Hyper. Please note - After defining the first user (The system Admin user), the setup mode will not be available anymore, and users will be able to log in, by using their defined usernames and passwords only. Countries & Logo - Define the logo of the organization, its activity countries and each of the countries local properties. For further information click here. Agencies - Define the agencies of the organization and their properties. For further information click here. Bookkeeping - The accounting and bookkeeping definitions of the organization. For further information click here. Sales - The sales module definitions and properties. For further information click here. Create the rest of the required users and employees cards and define their authorization groups. Hyper allows its users to define fields Rules according to the requirements and needs. Therefore, in each of Hyper modules, including the Clients module, spare fields can be defined in addition to the default fields. The definitions of the fields rules and layout are available for each user, according to the defined authorizations in the user card. Hyper was designed to remove every client card that was defined as "Fictive", to the "Bad Client Leads" table. The clients details are moved from the "Clients" table fields to the "Bad Client Leads" table fields, according to each of the fields names. Therefore, in order to avoid a lost of data, the "Bad Client Leads" table should contain all of the required fields names, from the "Clients" table. These fields should be added and defined by the system admin. spare strfld 01 = Fld_Service_Subject; in the "Spare Field Customization" tab, choose the "select" in the "Editor Type" field. Please note - these fields must be defined exactly as described above. Calendar Access - The system admin should define the calendar access authorizations. As default, each calendar is visible to all of the users. This authorizations can be defined in the "Authorization" tab of the user card, in the following two fields: "Team Calendar Access" and "Block User's Calendar Access by Default". Mandatory fields for new meetings - The system admin should define the required mandatory fields for each new meeting. Special Dates and Holidays - In order to define the local special dates and holidays, open the "Agencies" tab of the System Fundamentals. In the "Add to Calendars" field, select the relevant dates and holidays from the list. Calendar Graphic View time frame - The graphic view of the calendar, can be defined according to the users needs. In order to define the displayed time frame of the calendar, open the "Global & Basic" tab of the System Fundamentals, and fill in the required hours for "Calendar Graphic View From Hour" and "Calendar Graphic View Till Hour". Weekend Days - The weekend days of the organizations are defined in the "Agencies" tab of the System Fundamentals. In the "Local Date Mask: Weekend On Fri-Sat" field, choose "YES" to set the weekend as Friday-Saturday. Choose "NO" to set the weekend as Saturday-Sunday. Send Calendar Updates via Email by Default - As default, Each Calendar update is automatically sent to its attendees. In order to change this definition, open the "Global & Basic Settings" tab of the System Fundamentals and choose "NO". This can also be defined for each meeting by pressing the Send Invitations via Email. Fields for Calendar Meeting Window - Each meeting preview frame in the calendar, displays some of its information fields. In order to select the required fields for the preview, open the "Global & Basic Settings" tab. In the "Fields for Calendar Meeting Window", add rows (Ctrl+Enter) and select the required field name for the meeting preview. Calendar Limit Total Number of Participants to - This field in the "Global & Basic Settings" tab, allows to define a limit for the number of participants in each meeting. Leave this field empty if you wish to allow any number of participants. Local Date Mask - The local date mask is defined in the "Agencies" tab of the System Fundamentals. In the "Local Date Mask: Day Before Month" choose "YES" for the DD:MM mask, and "NO" for the MM:DD date mask. Employment Details - The working hours of each employee are defined in the "Employee Details" tab of the User card. In the "Shifts Layout" table of this tab, fill in the the working hours in each day of the week. For further information about this tab, press here. Desktop Type - In order to define the required desktop type of the user, open the "Use Care" menu, and choose the "Local Computer Setup" option. In the "Running on Desktop Type" field, choose the required option from the list. Team Calendar Color - A team Calendar Color can be defined for each agency. In the "Agencies" tab of the System Fundamentals, select the required color in the "Team Calendar Color" field. To leave the selected agency with no color, choose the black color from the list. Meeting Invitation Confirmation - Some of the Email systems do not support Hyper and therefore can not reply and confirm / cancel the invitation. For further information about the calendars, click here. The "Product Design Module" of Hyper allows to create and manage products / items / services, provided by the organizations. Each product has a product card that includes all of its details and properties: description, prices and costs, measures, render product configuration tool, campaigns, supplier details etc. For further information press here. Open the "Orders" and the "Orders Header & Footer" tabs of the system fundamentals, to define the orders definitions as well as the default Header and footer content for the orders forms. Hyper allows its users to use search fields to search for required Clients / Suppliers / Products etc., according to identifying fields. 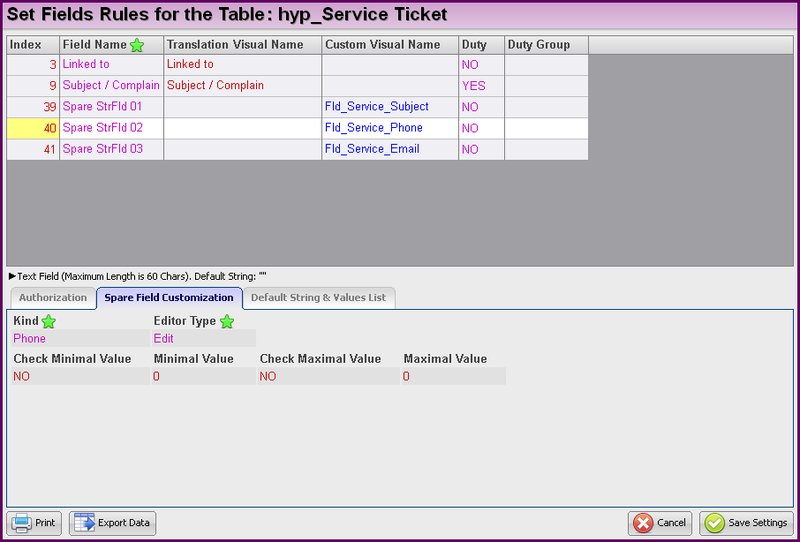 Also, Hyper allows to use the "Search Wizard" and create custom filters according to the users needs and requirements. This search can be done by using the defined filters or by using actions buttons that were designed to execute the custom search. Hyper allows its users to import clients / leads lists from external sources into the Database, and simply add these lists to the exist clients. This action is available from the "System Fundamentals" menu, by choosing the "Import clients from a List" option. The import is done from an Excel file that includes all of the clients and their details. For further information about this option, click here. One of the most important activities in any marketing and sales system is managing the leads - the potential clients of the organization. Hyper allows to receive data from external sources, by using the Web Data Port. The organization can use this tool of Hyper, to receive new leads, orders, service tickets and feedback. This data can be received from Email messages as well as from landing pages, into Hyper's tables. This tool is available from the "Marketing & Web-Content" module. For further information, click here.